I sat down for chat with a friend and her adorable two year old daughter yesterday. She lives a fair distance away, so it was great to catch up and watch her daughter playing with the grapes she was supposed to be eating. 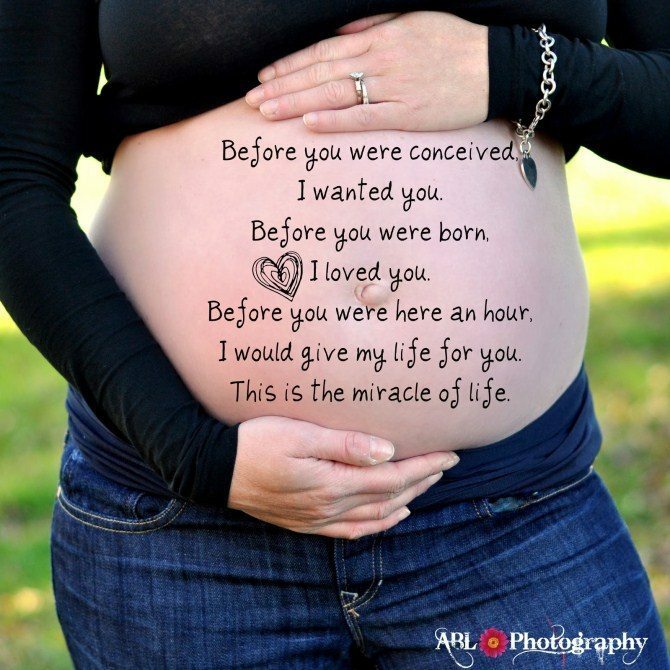 And then I thought about all of us with friends interstate and overseas and how brilliant pregnancy photos are as a way to share the journey with them. 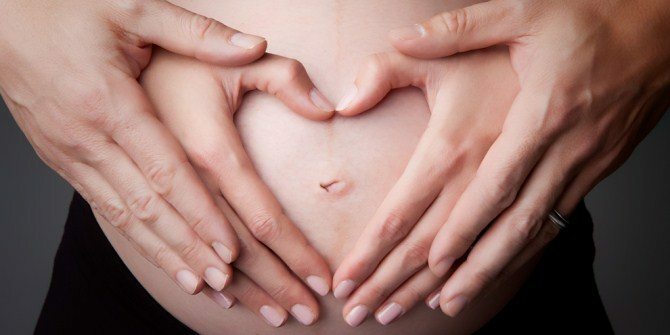 It’s no secret that mums to be can be a little tired – especially in the first trimester – so I’ve found some super cute ideas for anyone wanting to celebrate their bump. 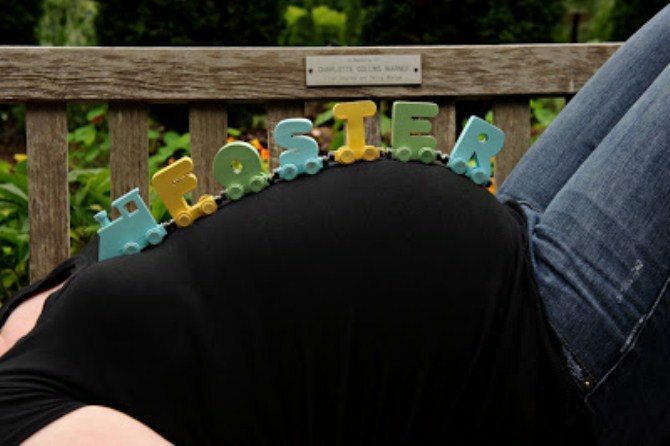 This mum-to-be wanted to spell out her son’s name across her belly with a train of letters. She could visualise the perfect set, but when she started searching online it just wasn’t available. She popped down to the local hardware and found a pre-cut train set just waiting for decoration. Add set of letters, some spray paint and some glue and she came up with this! Perfect for the crafty mums out there. If you’d like step by step instructions they’re on the Worth The Wait blog. For some unbelievable glamour check this out. 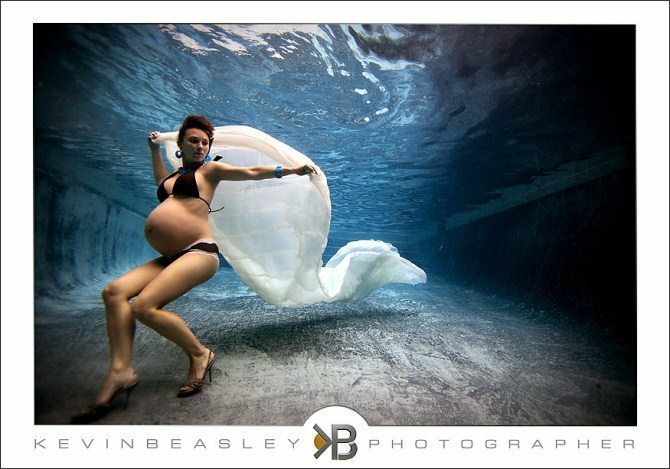 It’s one of an incredible series of underwater pregnancy photos from photographer Kevin Beasley. The water supports this mum wonderfully and lets her move in ways that just wouldn’t be possible on solid ground. Check if you or your photographer have a camera that’s safe for underwater use and get floating! Having little kids reminds you of all kinds of fun things you haven’t done since you were a kid yourself. Like getting your face painted. But why wait for your baby to be born? 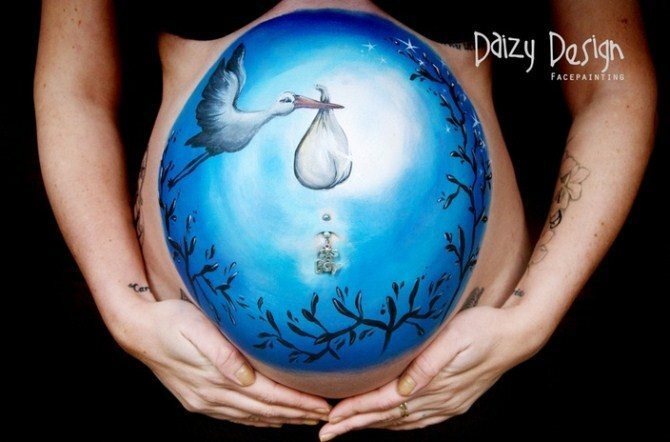 This mum got in early, spoke to the incredible artists at Daizy Designs and got her belly painted instead. I have to admit I’m a keep it simple kind of person. 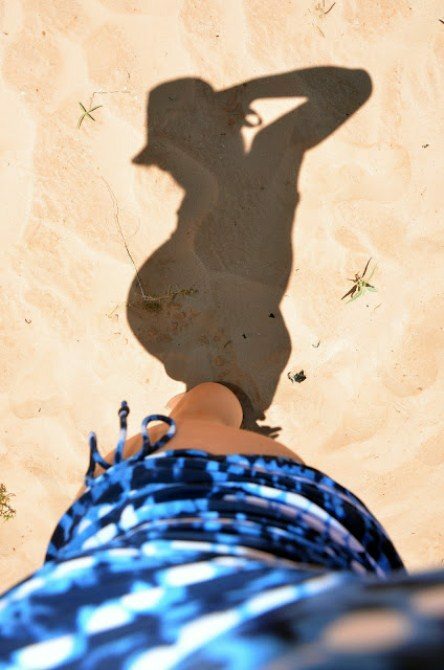 So if you’re looking for great shots that don’t need complicated props – then why not use the sun? The quick thinking couple at Johnny and Ashley in Real Life did – and it looks fantastic. 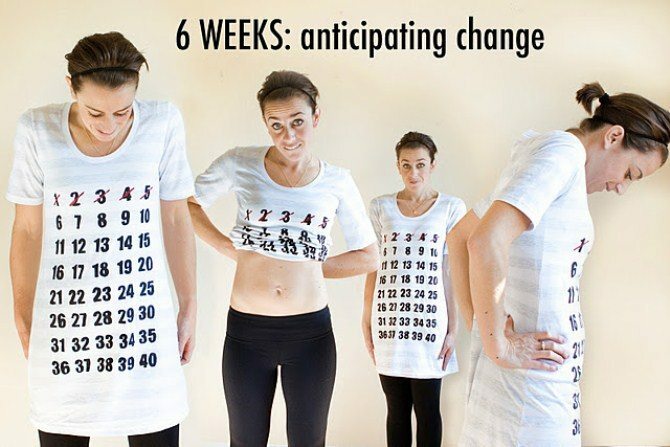 For more super-easy shots have a look at this t-shirt calendar. Just cross off a number before you take your photo each week and you can give your friends an update and a countdown at the same time. How exciting! Find out more at One Little Minute Blog. 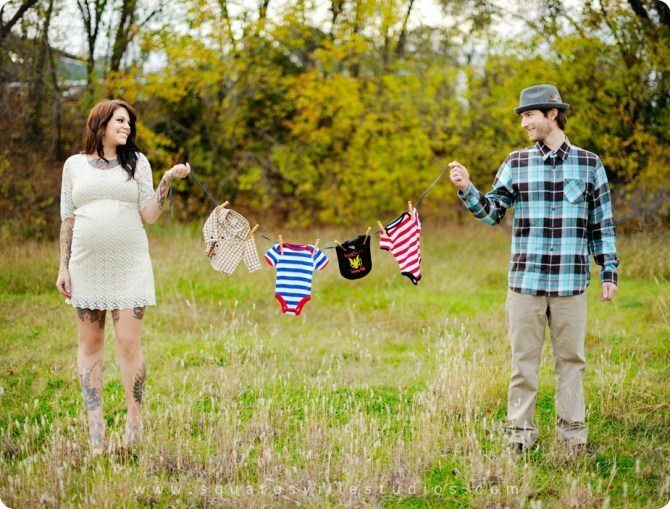 This little family on Love this Pic made me melt. The umbrella is gorgeous and it’s just such an intimate, loving moment – especially because their bodies touch. 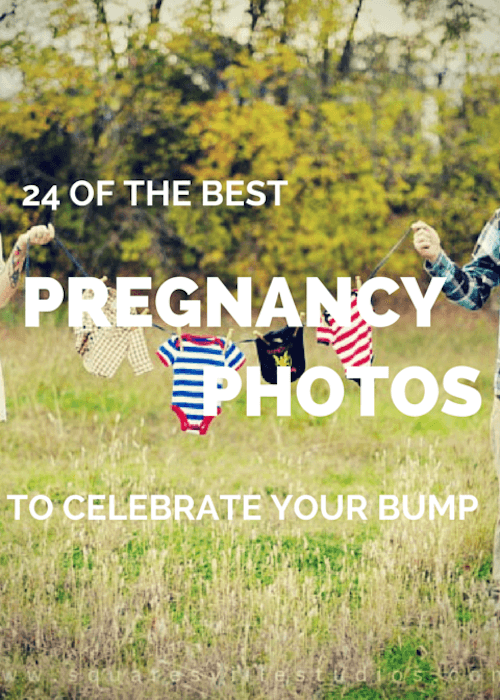 If gifts for your baby have already started arriving – and I’ll bet they have – then why not include them in your photos? Photographer Maria Hibbs has used baby clothes as a great colourful addition. And in years to come these photos will be a good reminder of how tiny those jumpsuits really were. There’s so much to do before a baby arrives: finding a cot, a change table, sheets, a mobile, wet wipes – that it’s possible you don’t want to add even one extra thing to the list. The good news is you don’t have to – these shots from Phillips Photography prove that the baby’s room will also make an ideal backdrop for you. 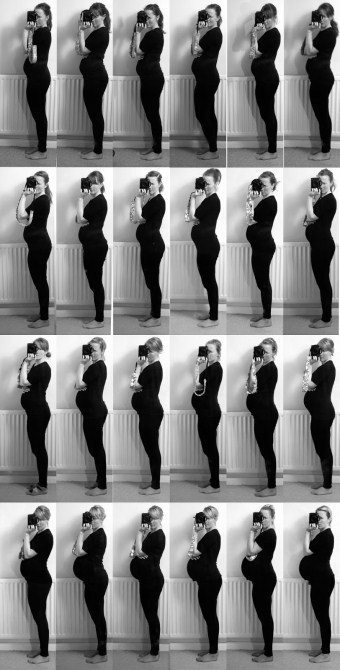 Week by week this mum, who blogs at How to Paint the Sky tracked the progress of her growing bub by taking these dramatic selfies. Wearing a black outfit in the black and white shots creates a great sense of contrast. If your growing baby is taking on a starring role at your wedding – then it’s the perfect opportunity to get all the important photos taken at once. This sash from BrightStarrBoutique is like a flower crown for the body and is also a sneaky way to make sure the fabric of your dress drapes over you at the best possible angle. Talk about effortless style! 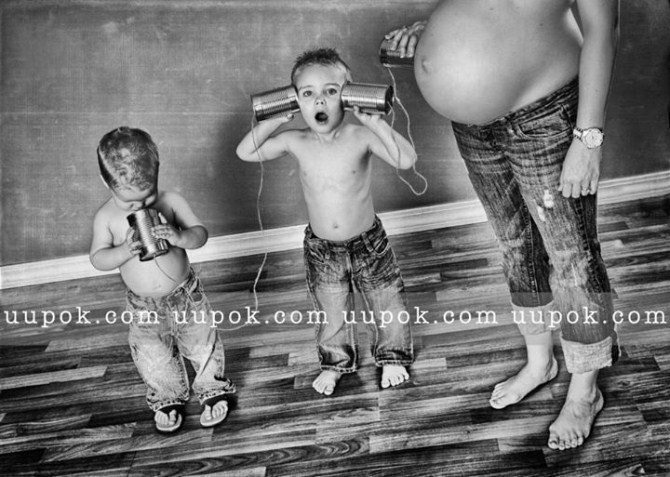 It’s so important that your other children feel valued and included during a pregnancy, and with results this adorable, why wouldn’t you include them in your pregnancy photos too? Braedon Flynn the photographer from 100 layer cake-let blog shows us how it’s done. The sense of curiosity here just jumps out at you! For a loving couple – nothing beats a kiss. (At least I know that’s true for my partner and I.) 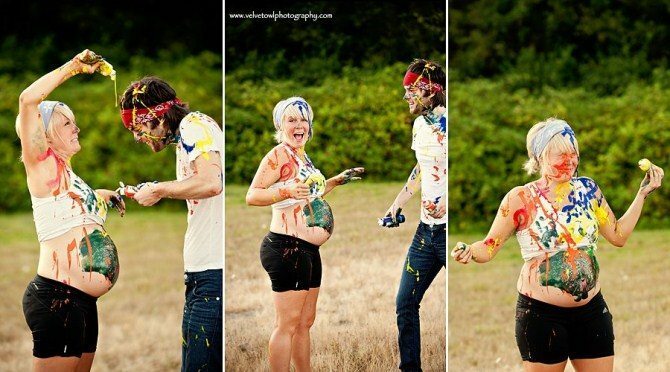 So it’s no surprise that this couple on Love this Pic are capturing their love for the baby with a classic kissing the belly shot. Awwwwwwww! 13. Did You Feel A Kick? This Polish mum looks so relaxed. She was captured by Kat Bartoszewicz who has used booties as a lovely way to remind us about who’s inside. I have a secret weapon for Monday-itis. It’s a bit cheesy. But I save memes with great quotes on them to the photos section on my phone – for a quick laugh or shot of inspiration. It seems like Aimee B Lefever at ABL photography would completely understand. If you’ve found a quote you adore – then Photoshop is your friend. 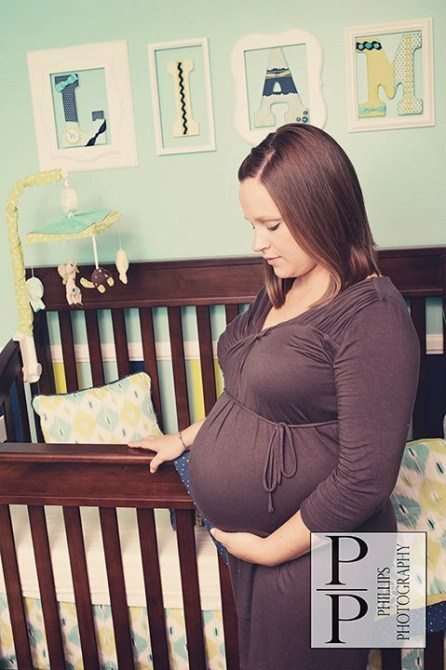 I love the fact that this mum is cradling her baby – even before it’s born. Stephanie Zahn from Caught Fire Photography clearly has her priorities straight – she knows that no matter how young or old you are: hugs from Mum are the best. If you had told me a couple standing back to back could be such an awesome picture of support – I honestly wouldn’t have believed you. But thanks to the wonders of blog The Samantha Show, the skills of Katelin Elizabeth Photography and the power of the internet I am now completely convinced. Remember those cartoons you watched as a kid? The one’s with superheros who could see through solid walls? Well, thanks to the smart thinking of the people at The Little Umbrella and the beautiful work of Tara Sierra Photography we can pass on a great tip. 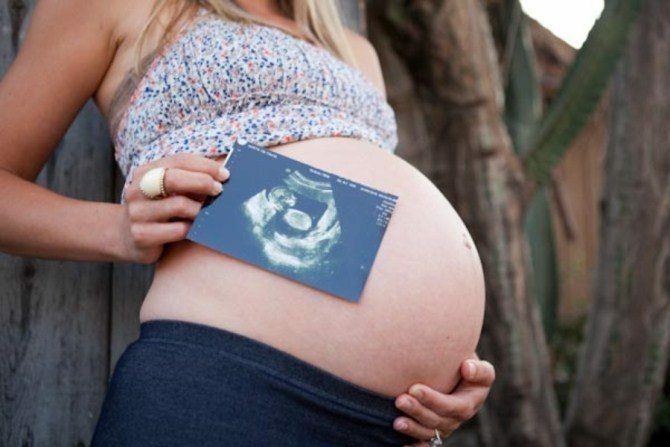 If you use your ultrasound you can give everyone x-ray vision. Now, we just need to work on flight. 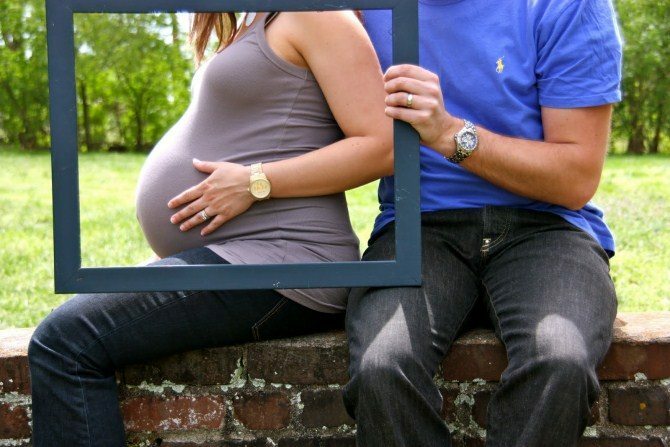 Instead of putting your pictures in a frame why not put a frame in your pictures? Stella Bella blog did. It’s a focus for attention and another way to include your partner in the fun. 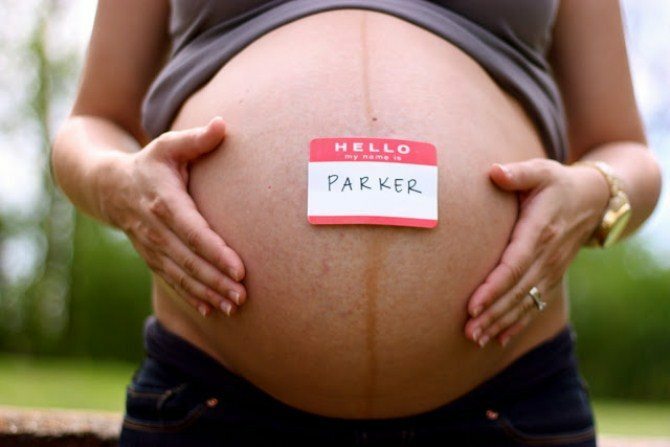 Deciding on a name – so controversial. I got a text from one couple announcing the birth of their son Simon – and three days later another text which said. Sorry everyone: he just doesn’t feel like a Simon! We’ve decided his name is Theo. But if you’re feeling as certain as this mum from Stella Bella blog then go ahead and let your little one introduce themselves. Because why wait until the baby is born for your kids to start playing together! The people at Uniquely U Photography show you how it’s done. While we’re talking about play. Have a look at what these parents managed with just a few tubes of paint. Maximum fun and no artistic experience required. This stunning example is from Heidi Haden at Velvet Owl Photography. Whatever you do in your photos – one tip is that it should reflect your family and the things you love. These beach bunnies are bringing their baby into their world already – another piece of inspiration from 100 layer cake-let blog. If you love the idea of an outdoor shoot but the beach isn’t your style then hopefully these stunning nature shots from Mike Rick photography are more your style. Well, I guess there’s a lot I could say about this photo. Especially about how the belly button looks like a cute little smile. 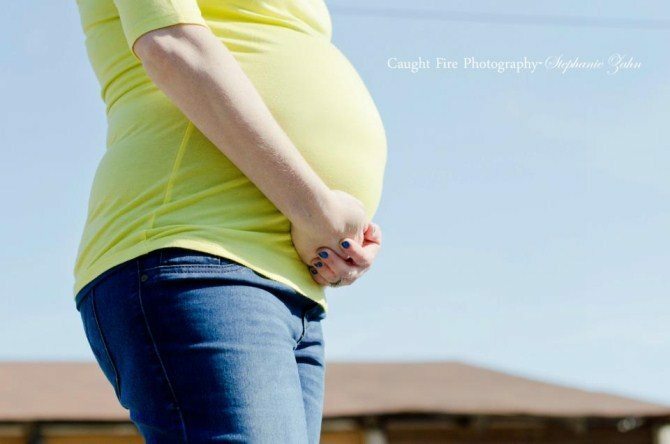 Even though my belly button is no where as cute as the one in these Phoenix Maternity Photographer’s shots – I can still imagine myself going for this pose. Because they do say love is all you need after all. Once you have the perfect photo, why not print on canvas to create an everlasting memory of this amazing time? And whatever you do in your baby shots don’t forget to have fun. And please let me know in the comments if you’ve thought of more ideas.